With Fall approaching I realized I wanted a new wreath for a back door. Of course I was not going to make another yarn wreath due to all the drama from my first two. I looked around and found some pretty book page wreaths and coffee filter wreaths. While I really like both options, I am lazy busy, and I didn't want to spend lots of time scrunching coffee filters or cutting books up. Instead I decided to use fabric from my goodwill stash. I took a long, neutral, linen skirt and a deep purple, cotton sleeveless, shirt and cut them all up. The linen kind of looks like burlap but not as scratchy, and the cotton looks like bias tape or ribbon. Oh and I found more vintage lace stuck in my craft stuff along with mustard, brown, and cream felt. First choose your fabric and felt. Cut fabric into about 15 2" strips. 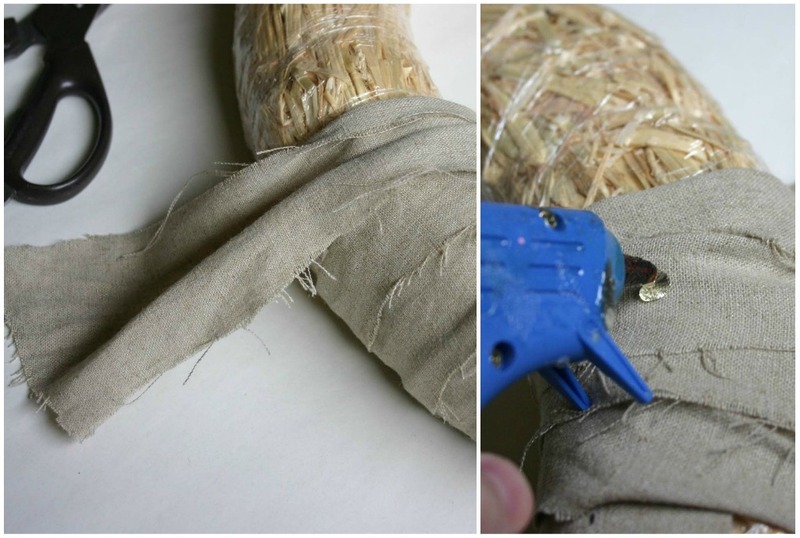 Hot glue an end of fabric to the back side of the wreath and allow to cool. Then wrap the fabric around the wreath covering the end and and continue wrapping the remaining fabric around the wreath overlapping it so none of the wreath shows through. * Once you reach the end of the strip of fabric hot glue the end to the back side of the wreath. Continue until the wreath is completely covered. 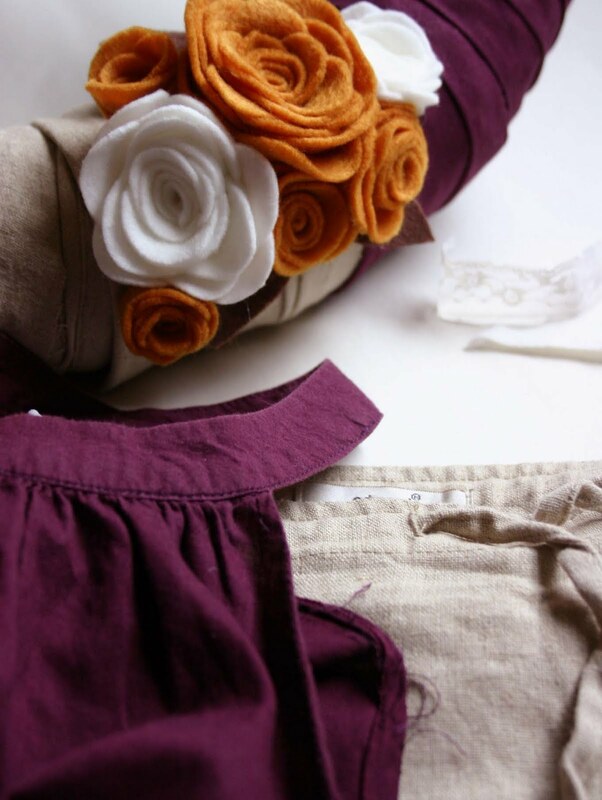 *For a shabby look (see the neutral fabric above) bunch the fabric together as you wrap where the frayed ends show. 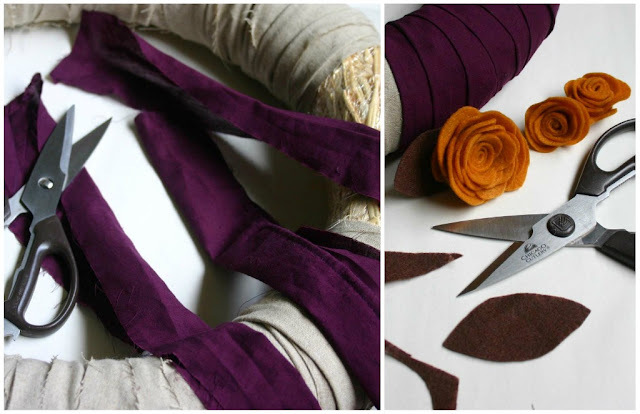 For a cleaner look (see the purple fabric below) simply fold your fabric strips in half and be sure to cover the frayed edges with the folded ones as you wrap. 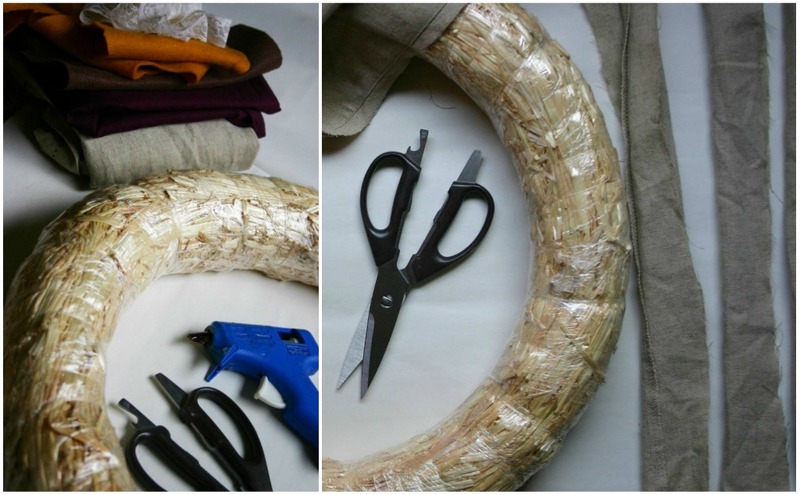 Choose your embellishments and hot glue them to the front side of the wreath. I went with vintage lace and felt flowers and leaves. 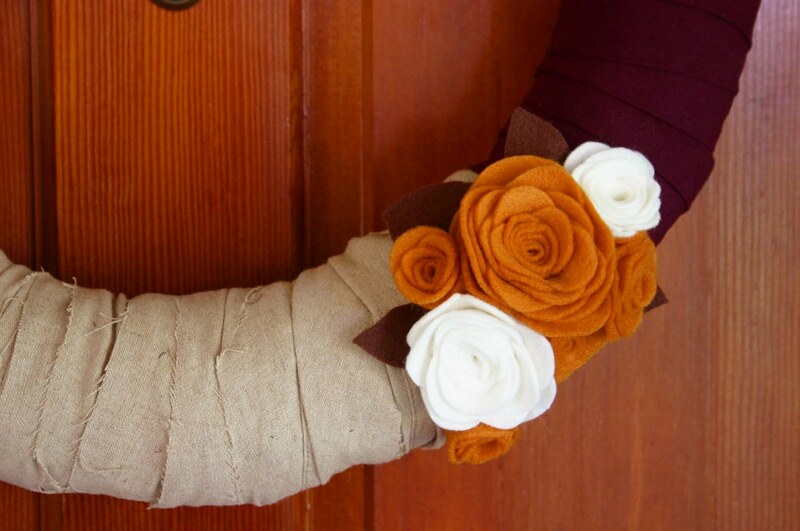 You can use Danielle's tutorial to learn how to cut felt flowers. . . be warned she is the one who introduced me making a yarn wreath, and she is obviously better at it than I am. 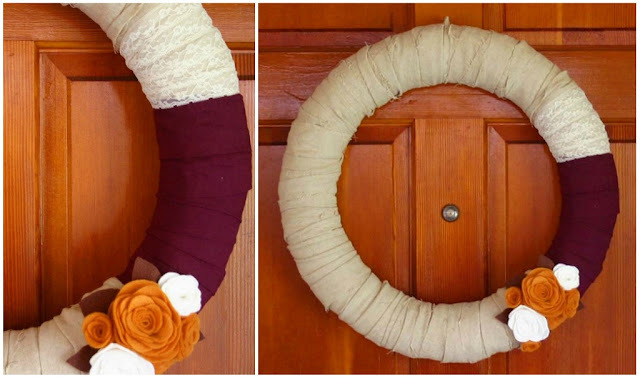 Hang your pretty, new Fall wreath on your door. Make a pumpkin spice latte I keep hearing everyone talk about or an apple cider and count the days until Fall is officially here (14 days, I think). Told you I was not ever making another yarn wreath again. PS. If you make one let me know! 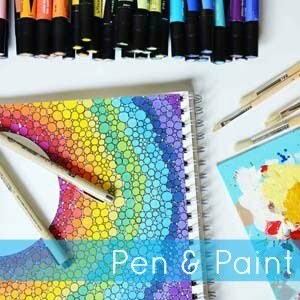 I want to see what you create.